Videos, worksheets, examples, solutions, and activities to help Geometry students learn about rotational symmetry. The following table gives the order of rotational symmetry for parallelogram, regular polygon, rhombus, circle, trapezium, kite. Scroll down the page for examples and solutions. Symmetry in a figure exists if there is a reflection, rotation, or translation that can be performed and the image is identical. Rotational symmetry exists when the figure can be rotated and the image is identical to the original. Regular polygons have a degree of rotational symmetry equal to 360 degrees divided by the number of sides. What is the order of rotation and angle of rotation? A figure has rotational symmetry if it coincides with itself in a rotation less than 360 degrees. The order of rotation of a figure is the number of times it coincides with itself in a rotation less than 360 degrees. The angle of rotation for a regular figure is 360 divided by the order of rotation. How to find the order of rotational symmetry of a shape? The order of rotational symmetry of a regular polygon is the same as the number of sides of the polygon. You can also deduce the order of rotational symmetry by knowing the smallest angle you can rotate the shape through to look the same. The product of the angle and the order would be 360°. The original triangle, labeled A, has been reflected across the first line, resulting in the image labeled B. Reflect the image across the second line. Carlos looked at the image of the reflection across the second line and said, “That’s not the image of triangle A after two reflections; that’s the image of triangle A after a rotation!” Do you agree? Why or why not? When you reflect a figure across a line, the original figure and its image share a line of symmetry, which we have called the line of reflection. When you reflect a figure across a line and then reflect the image across a line that intersects the first line, your final image is a rotation of the original figure. The center of rotation is the point at which the two lines of reflection intersect. The angle of rotation is determined by connecting the center of rotation to a pair of corresponding vertices on the original figure and the final image. The figure above is a 210° rotation (or 150° clockwise rotation). Line of symmetry of a figure: This is an isosceles triangle. By definition, an isosceles triangle has at least two congruent sides. A line of symmetry of the triangle can be drawn from the top vertex to the midpoint of the base, decomposing the original triangle into two congruent right triangles. This line of symmetry can be thought of as a reflection across itself that takes the isosceles triangle to itself. Every point of the triangle on one side of the line of symmetry has a corresponding point on the triangle on the other side of the line of symmetry, given by reflecting the point across the line. In particular, the line of symmetry is equidistant from all corresponding pairs of points. Another way of thinking about line symmetry is that a figure has line symmetry if there exists a line (or lines) such that the image of the figure when reflected over the line is itself. Does every figure have a line of symmetry? How to find the angle of rotation for regular polygons? The angle of rotation of a regular polygons is equal to 360 degrees divided by the number of sides. The order of Rotational Symmetry tells us how many times a shape looks the same when it rotate 360 degrees. Determine the order of rotational symmetry for a square, a rectangle and an equilateral triangle. Introduction to rotational symmetry with fun shapes. Learn to identify rotational symmetry. Tell whether each figure has rotational symmetry. If it does, find the smallest fraction of a full turn needed for it to look the same. 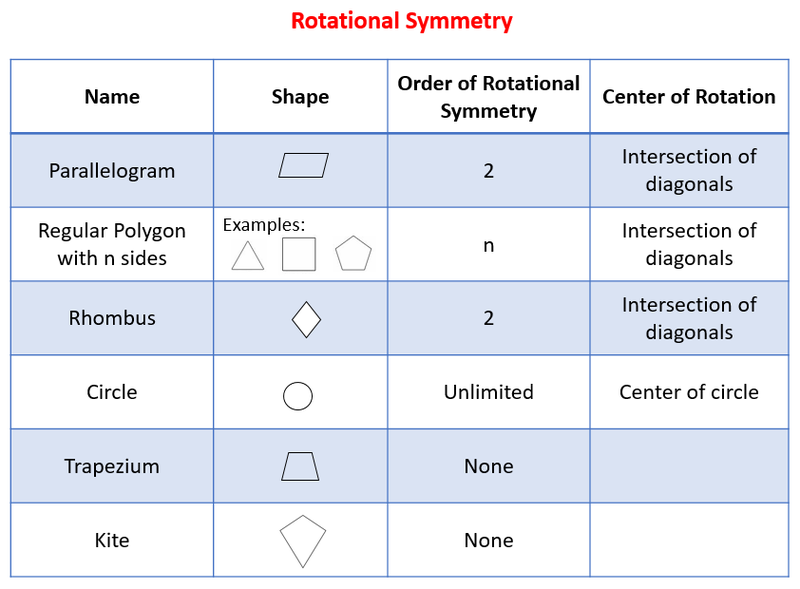 Learn to identify and describe rotational symmetry. How many times will the figure show rotational symmetry within one full rotation? Also, identify the degree of rotational symmetry.